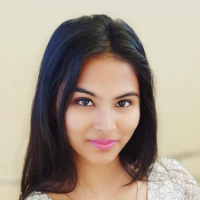 Aakriti Jaiswal did her schooling from Guru Nanak Fifth Century School, Mussoorie. After that, she did B Com from Shaheed Bhagat Singh College, Delhi. Following her passion for writing and fashion she started blogging during the college days. Soon after the college she worked for Promo Edge Media Private Limited, Delhi as a Marketing Manager for one and a half years. Thereafter, she started full time Fashion Blogging by the name of Unicobella. A blog is an online journal or informational website displaying information in the reverse chronological order, with latest posts appearing first. It is a platform where a writer or even a group of writers share their views on an individual subject. Fashion blogging covers many things such as specific items of clothing and accessories, beauty tips, trends in various apparel markets etc. "After doing my schooling from Guru Nanak Fifth Century School, Mussoorie, I did my B Com from Shaheed Bhagat Singh College, Delhi. Following my passion for writing and fashion, I started blogging during my college days. Soon after my college I worked for Promo Edge Media Private Limited, Delhi as a Marketing Manager for one and a half years. After that in 2008, I started full time Fashion Blogging by the name Unicobella."